This month we remember Second Street when it was part of a neighborhood. It came out of the woods to the west and ended with a name change to “Hill” in the east. Only four blocks long, family homes, even mansions, mixed with two meeting halls, churches and one livery stable, where you could rent a horse and buggy for a Sunday ride in the country. Change in the air landed when Poier Motors opened its new dealership on the north side of Second Street between Avenues A and B in 1947. Across the street was the Presbyterian Church pictured above in a photograph by Index resident Lee Pickett taken around 1910. The cornerstone of the church was dedicated in 1904. St. John’s Episcopal Church, 1893, is half a block east, where it still stands and serves. If retracing our steps at the turn of century, we pass three family homes, then come upon two large halls facing each other across Avenue C. The Odd Fellows, 1885, is still standing, while the site of Masonic Hall, 1879, on the southeast corner is now a parking lot for business operations. Across the street, stands the stately Gretchell House since 1885. It’s a surviving peek at the grand residential style that has been lost to the sometimes selfish demands of progress. When Charles Poier purchased the lot on Second for his dealership, it was a hill overlooking First Street and the hustle and flow of the Snohomish River. 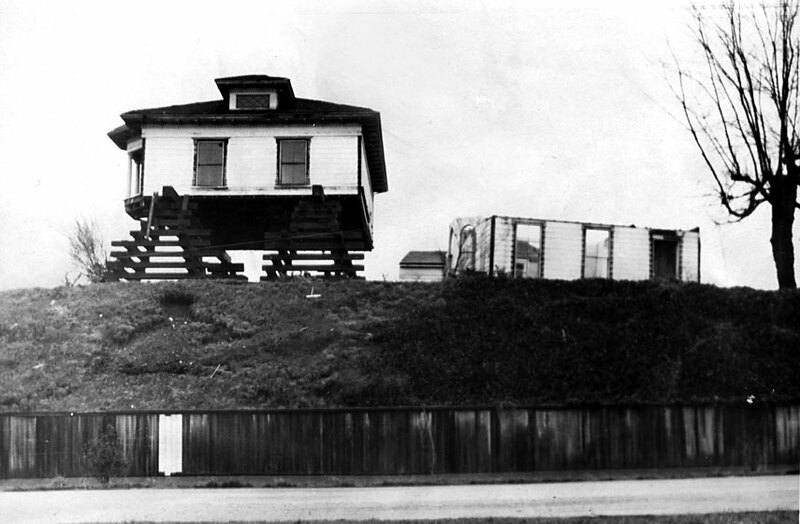 Of the two mansions on the hill, only one is remembered as the family home of Lot Wilbur, Snohomish’s pioneer druggist. As Charles’s son Art tells the story, the Wilbur mansion was of such solid construction that it survived dividing the three floors into three new homes now located somewhere around Glen Avenue and Fifth Street. Empty of homes, the hill was removed, used to build the dikes that still control the Snohomish River. 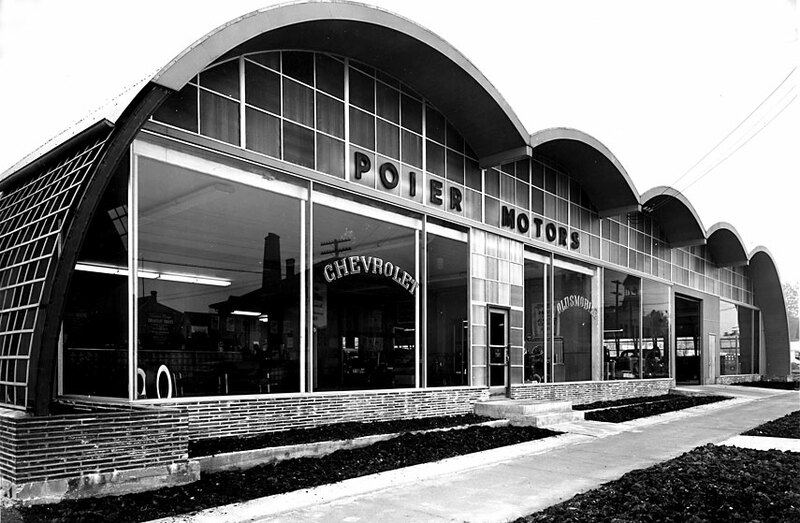 Poier’s new building featured a multi-arched roof that created a pillar-free showroom for the still popular Chevrolets of the 1950s. Its conversion into a two level furniture store, however, is crazy with pillars today. In 1966, Poier purchased the land under the Presbyterian Church. He carefully removed it piece by piece, and opened a used car lot. It was a handy lumber yard when Karen and I were fixing up the old St Michael Church, just around the corner on Avenue B, but we would have to throw a heck of a party to use it today, in its new role as the Snohomish Events Center. Published in the Snohomish County Tribune, July 18, 2012. 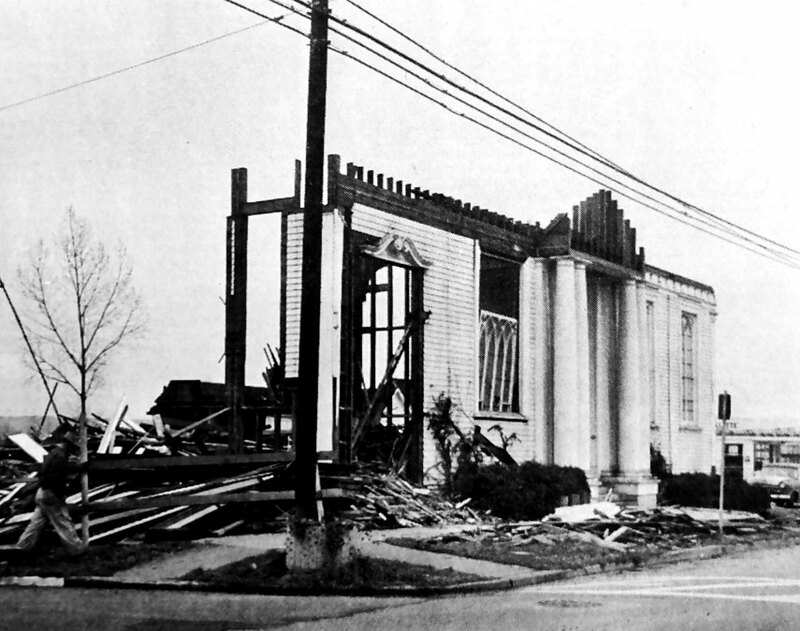 This entry was posted in Posts and tagged Lee Pickett, Presbyterian Church, Snohomish WA history on July 17, 2012 by warner.